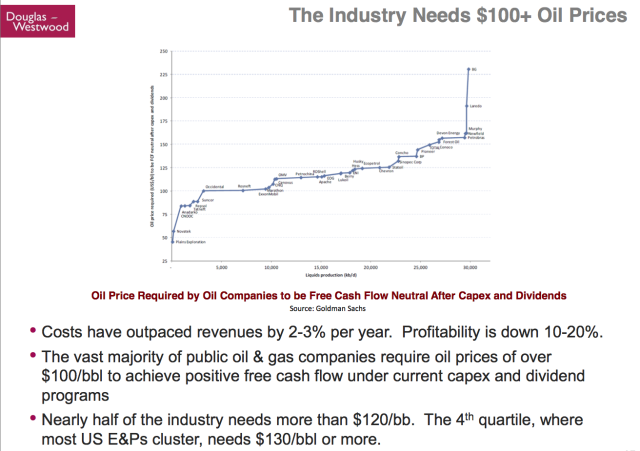 There has been much debate in this oil industry regarding this subject with a lot of poor analysis, no analysis at all, opinions, raw speculation, pure conjecture and every investment bank in the world talking their book on this subject. So we thought we would settle this question once and for all so that everybody is on the same page. We analyzed the Oil Market to determine this question definitively by checking the actual data. The only valid way of determining this matter in a rational and constructive manner. 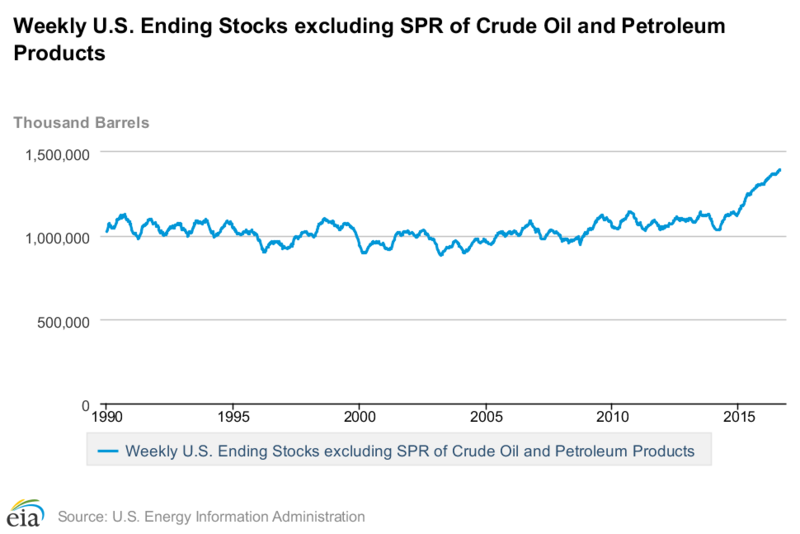 We drew down 18.9 Million of Oil Stocks during summer driving season in 2016. 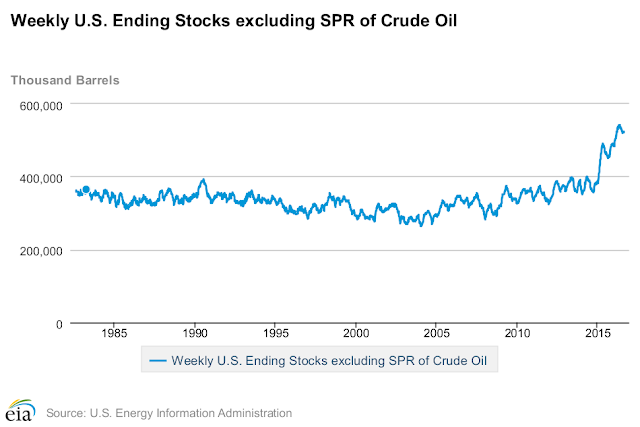 We drew down 28.6 Million of Oil Stocks during summer driving season in 2015. We drew down more oil in 2015 versus 2016 for the same strong season of the market, and we are sitting with an extra 65 Million more barrels of oil in storage year over year with less of a drawdown this year during the Summer Driving Season. 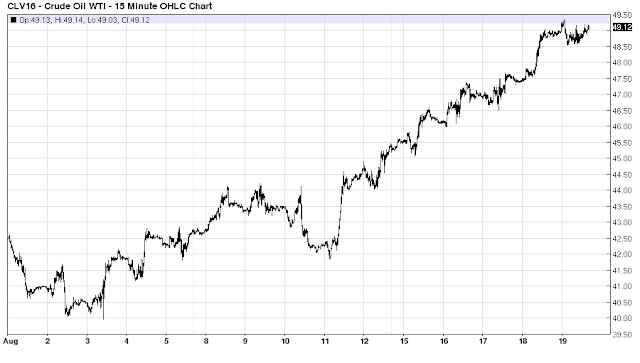 Therefore: Oil Market Not Rebalanced. 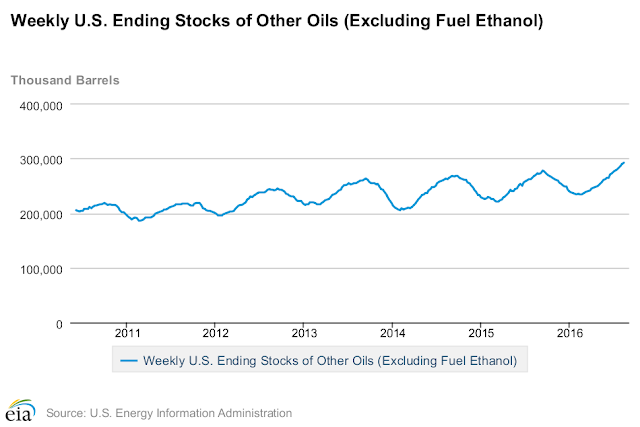 We drew down 7.9 Million of Gasoline Stocks during summer driving season in 2016. 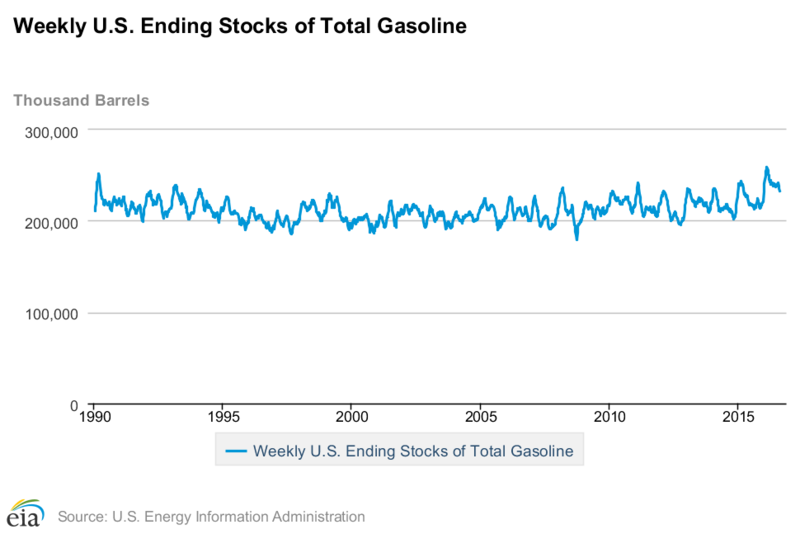 We drew down 13.9 Million of Gasoline Stocks during summer driving season in 2015. We drew down more gasoline in 2015 versus 2016 for the same strong season of the market, and we are sitting with an extra 20 Million more barrels of gasoline in storage year over year with less of a drawdown this year during the Summer Driving Season. 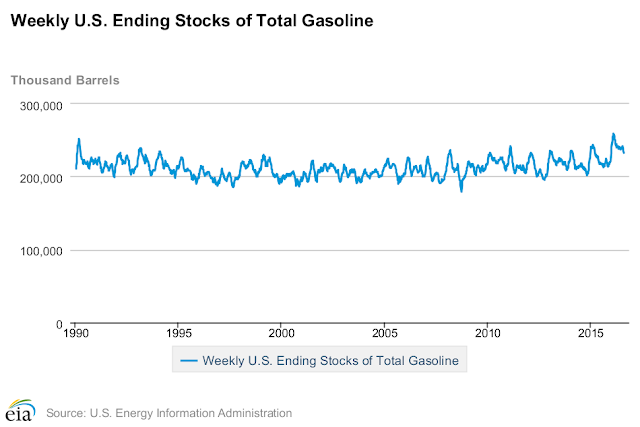 Therefore: Gasoline Market Not Rebalanced. We drew down 2.2 Million of Distillate Stocks during summer driving season in 2016. We built 20.1 Million of Distillate Stocks during summer driving season in 2015. We built more Distillate Stocks in 2015 versus 2016. 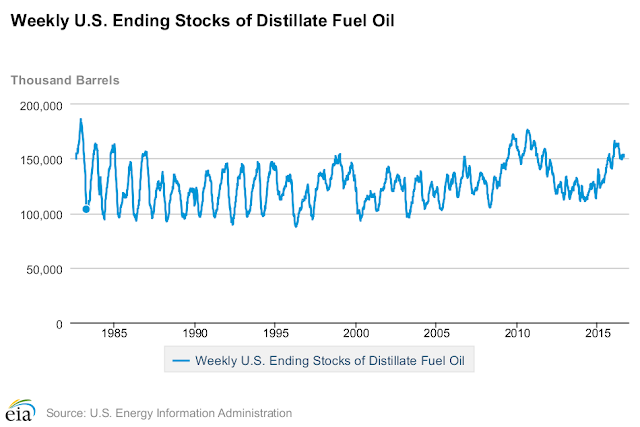 However, we are sitting with 5 Million more barrels of Distillates year over year. 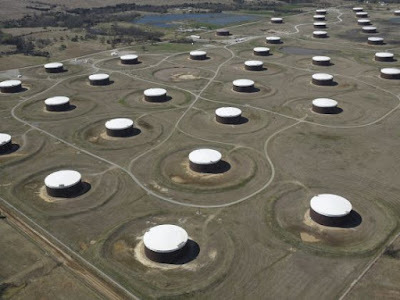 Furthermore, we were coming from such lower levels of Distillates last year there was more room to fill up storage facilities, and like Cushing this year once Oil Capacity reaches limits the Oil gets moved to the Gulf Coast. Well similarly for Distillates once inventories reach this level of overall capacity, refiners no longer want to produce extra supplies, so they have found other alternative products to process excess oil into product for available storage capacity. Therefore: Distillate Market Not Rebalanced. We built 20.6 Million of Propane Stocks for this time period in 2016. 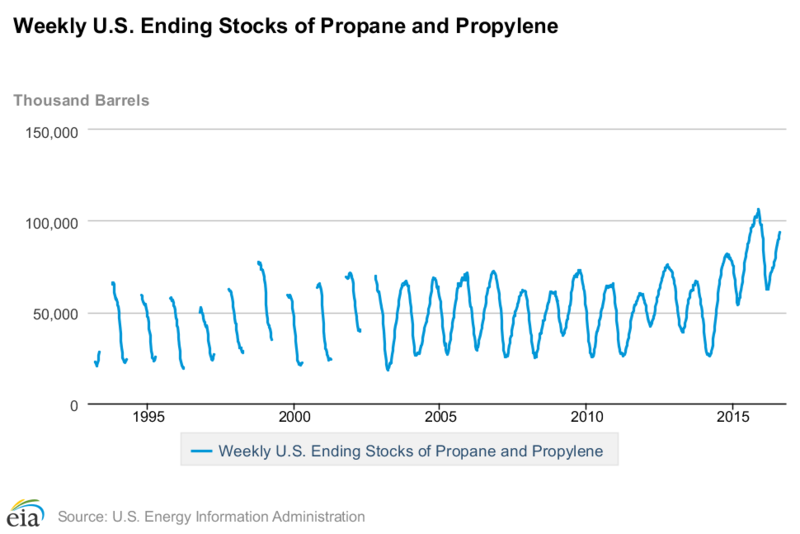 We built 25.4 Million of Propane Stocks for this time period in 2015. We built more Propane Stocks in 2015 versus 2016. However, we basically have the same levels of overall stocks (Which are at Record Historical Levels) as this time last year. The big takeaway is that over the last two years a lot of oil has been processed into this category for the sole purpose of doing something with the existing oil glut. Therefore: The Propane and Propylene Market Not Rebalanced. We built 24.1 Million Barrels of Oil and Petroleum Products during summer driving season in 2016. We built 35.7 Million Barrels of Oil and Petroleum Products during summer driving season in 2015. 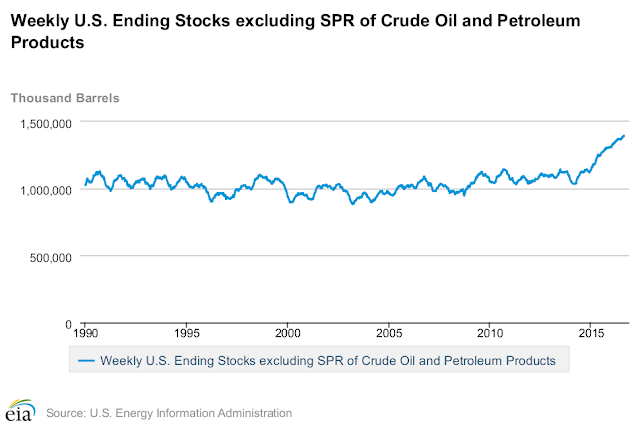 We built 11.5 Million more Total Crude Oil & Petro Stocks in 2015 versus 2016. 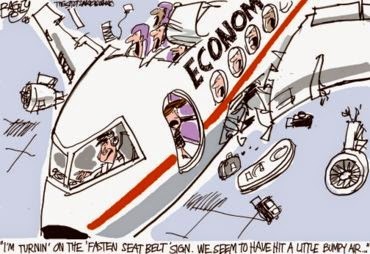 However, we still added another 24 Million to total overall stocks this year during the Summer Drawing and Driving Season. Moreover, we are sitting at 1,393,563 versus 1,280,261 for last year, for the highest ever Recorded Reading of this Metric by a large margin. Therefore: Oil & Petroleum Products Market Not Rebalanced. We built 38.8 Million Barrels of Other Oil Stocks during summer driving season in 2016. We built 29.2 Million Barrels of Other Oil Stocks during summer driving season in 2015. We built more Other Oils in 2016 versus 2015, but both years saw substantial builds, and my guess is that with Distillates Inventories at Record Levels, refiners needed to find other available storage capacity to move excess oil into refined product and chose this category “Other Oils”. We built 22.8 Million Barrels to this Other Category year over year, and is just another sign the oil market is in fact getting worse during the strongest demand part of the season. 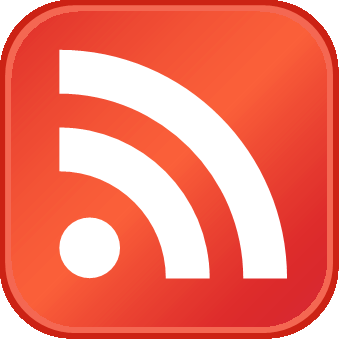 Therefore: Other Oils Market Not Rebalanced. The oil market is not rebalancing as some have suggested, in fact it appears to be still oversupplied by a large measure when taking into account the year over year additions to Total Stocks and comparing them to last year`s additions. Plus when you add in the effects of floating storage, the additions to alternative products for refined product there seems a desperate effort by the oil industry to move the commodity around from Cushing to the Gulf Coast, Gasoline Refining to Other Product Refining Categories to find any available storage capacity. 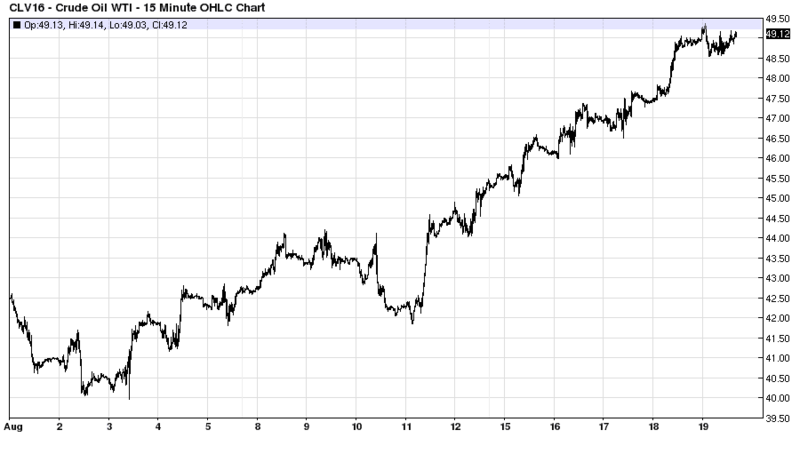 The Oil Market again moved up above $50 a barrel on the forward curve allowing more hedging for Oil Producers, and the reason the oil market hasn`t rebalanced is not enough producers went out of business. In fact the oil market is in such a state of denial that even if Saudi Arabia and OPEC agreed to a Production Freeze, or a Production Cut this would just allow more U.S. Production to come online in the form of the Completed Wells Category. There is still way too much Oil Supply, and the Oil Market is massively oversupplied, and actually getting worse as opposed to rebalancing. 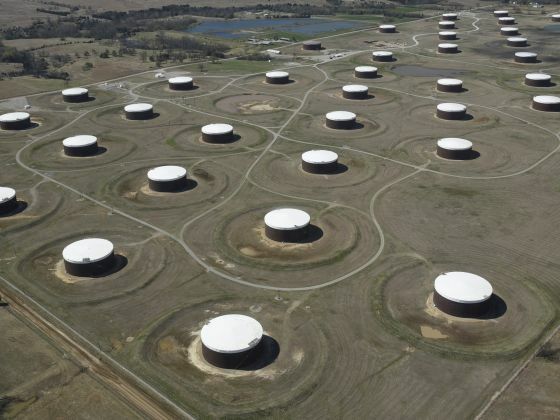 Just for context, the high end of the Five Year Average Total Oil Stocks used to top out at 250 Million Barrels of Oil each year, we are now more than double that level at 521,093 Million Barrels of Oil in storage.